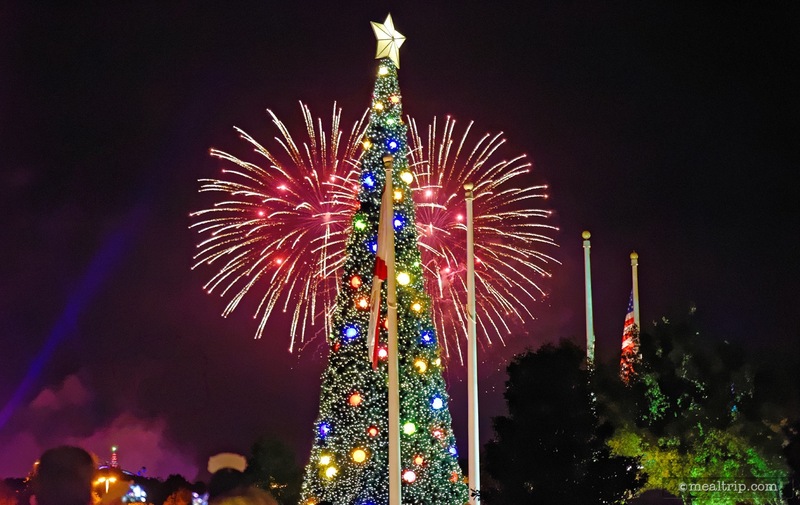 Ring in the new year in the most magical way during an elegant, all-inclusive event like no other at Disney’s Contemporary Resort. 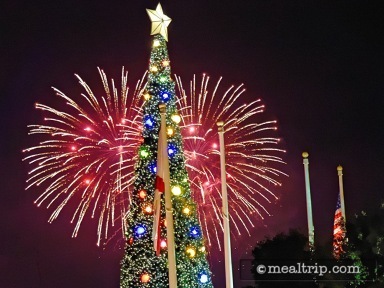 Starting at 8:00 PM on December 31, the "Disney Countdown to Midnight" event gives guests the opportunity to welcome the New Year at an extraordinary soirée held within the convention center at Disney’s Contemporary Resort. The fun begins as you head to the heart of the party in the Fantasia Ballroom, where you can indulge in an assortment of libations—including adult beverages for Guests 21 years of age and older—before moving and grooving to dance tunes from our interactive DJ, featuring music spanning from the ‘60s to today. Then, it’s time to marvel at a stunning display of culinary sorcery, as the chefs create incredible “cheftainment” behind animated shadowboxes. 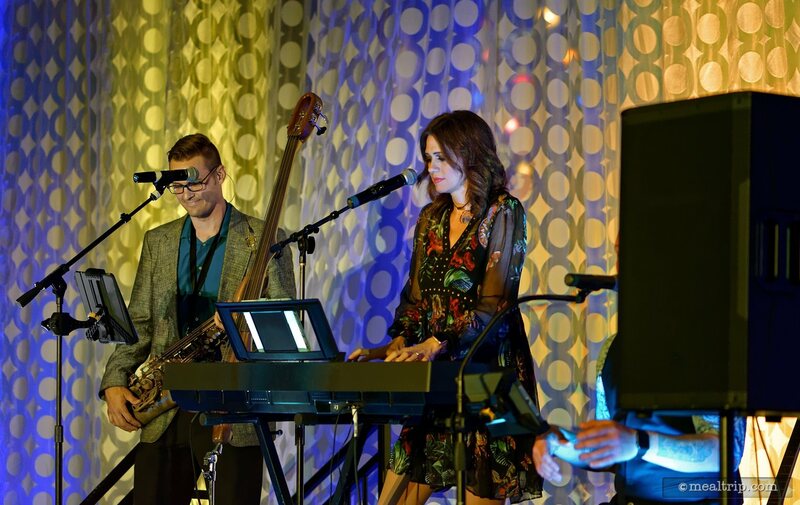 You’ll delight in seasonal bites from such signature restaurants as California Grill, Flying Fish Cafe, Jiko – The Cooking Place and Narcoossee's, before you’re invited to soak up the high-energy sounds of the New Year’s Eve Bash Band. Later, stroll outside to the Porte Cochère to sip champagne as the famous New Year’s Eve fireworks spectacular lights up the night from Magic Kingdom park! Throughout the evening, you can capture memories with a variety of themed photo ops and backdrops. It’s all remarkable—and it’s all included with the price of your ticket. Tickets are limited, so be sure to act soon before this special event sells out. How to Book To purchase a ticket now, please call (407) WDW-DINE or (407) 939-3463. Online booking is also available. Guests under 18 years of age must have parent or guardian permission to call. Disney's Countdown to Midnight is a New Year's Eve Celebration that (as the name might suggest) only happens once each year! The 2018-2019 event will mark the third time (in recent history anyway) that the big resort bash will be held in the Contemporary Resort's Fantasia Ballroom. Prior to this, there was a similar event around the Boardwalk area — and a smaller (but more elite) event at the California Grill. There are a two large New Year's Eve events happening at the Contemporary for 2018-2019… "Disney's Pixar Party: A New Year's Eve Celebration" is a (slightly) lower cost and family friendly event that is held on the second floor (up stairs) in the Contemporary's Convention Center — it's lower cost (at $190 per person) is mostly due to the fact that "libations" and adult beverages are not included in that price — just the food, entertainment (characters, DJs, etc. ), and environment. Disney's Countdown to Midnight (for 2018-2019) does cost $275 per person, but those "libations" and adult beverages ARE included (along with the food, DJ's, live band, and everything else, i.e. it's all-inclusive) — so if you drink like I do at these events, (at Disney prices), you'll cover the extra cost in no time. If you are in a bus or a car — leave early. There really is only one road into and out of the Contemporary Resort and the closer you get to the first round of fireworks at the Magic Kingdom, the more and more congested those roads get. Disney's suggestion about it taking 90 to 120 minutes to get there — from anywhere else on property, could be very accurate on New Year's Eve. Parking at the Contemporary is limited (if you're driving your own car) and while the guards to a good job of checking that you are on the event list before letting you in the parking lot… if you plan on arriving right at or just after the event start time, you may be out of luck as far as parking goes. If you're arriving by boat or Monorail (assuming there's no breakdowns) you shouldn't experience too much in the way of "traffic" because those services do run on a fairly regular schedule. There are signs for the various events all over the Contemporary, pointing guests in the correct direction. Just to try and give some sense of space here… if you walk into the front doors of the Contemporary lobby (from the valet area) — you'll have to hang a hard right, walk past the coffee bar, go back outside (it's fully covered) and head on over to the next visible building. This is the Contemporary's convention event space, and the Countdown to Midnight event is on the first (bottom) floor. Once in the correct building, there's a whole separate registration and check-in lobby area (the convention building is quite large). There may — maybe, might possibly — be a few tickets left to purchase for the event, but this is one event that does tend to get sold out months and months in advance, so I wouldn't count on it. I actually found this to the THE most organized registration and check-in process that I've encountered at one of these large Disney-based events. 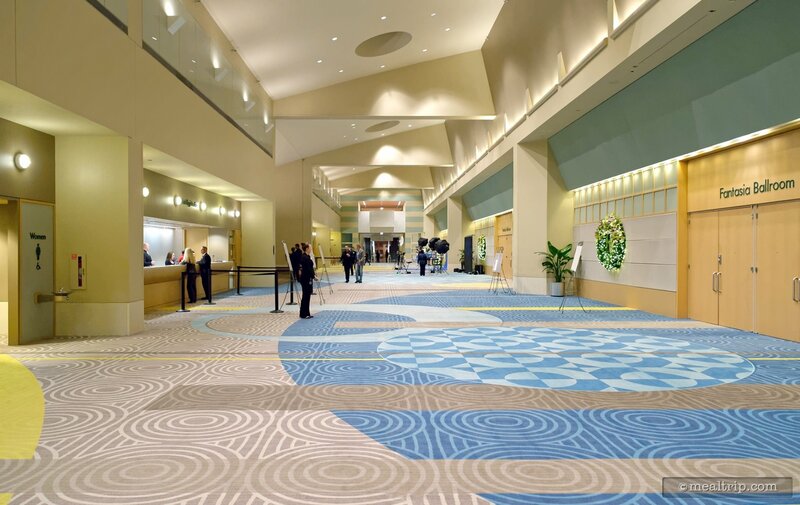 The convention lobby is very large, well staffed, and check-ins are split by last name… so "A" through "L" go to one side, and "M" through "Z" go to the other. It all went very smoothly. Check-in is important because here is where you'll pick up your table number! You'll definitely want to have a place to "go" once inside the event — and the check-in team will briefly go over what all is going on, what times various things will start, etc., and answer any questions you might have. The lobby and check-in area is quite large, and there's even some spill-over rooms on either end of the main lobby. 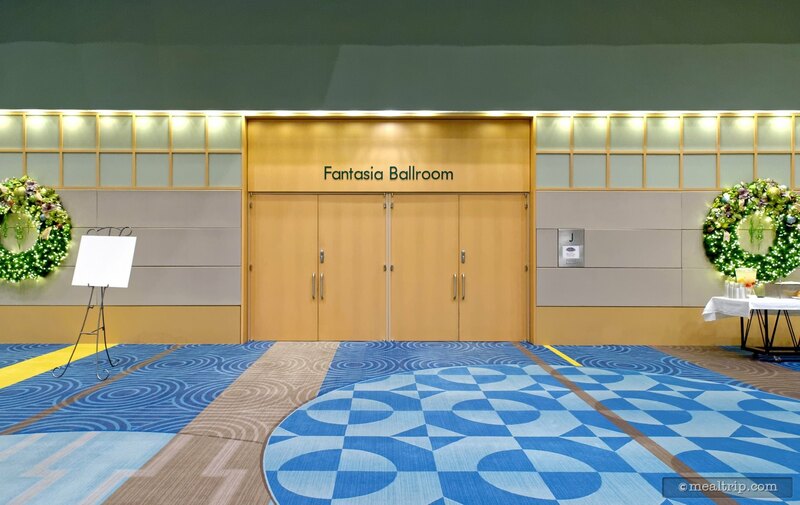 The doors to the Fantasia Ballroom remain closed until the event start time, so you may have a few minutes on your hands before the party starts. Fortunately, there's a couple of cool little perks while you wait. There are several fruit infused ice water stations around which get refreshed often. It's always a good idea to stay hydrated before sampling too many libations over the course of the event! Out here in the lobby area, you'll also find several teams of Disney Event Photographers. These cast members are not part of the "photo pass" group, they mainly deal with weddings and convention photography at Disney (i.e. better gear, better photo - sorry, no offense to the Photopass Team). 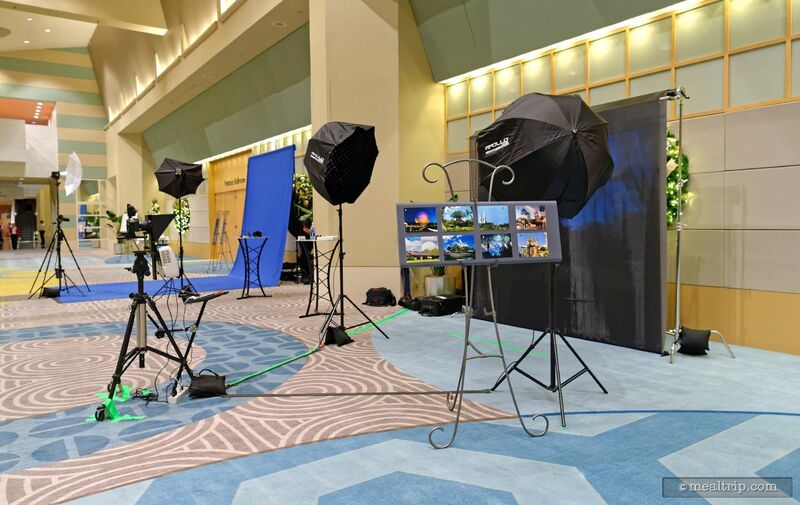 There are several stations set up with lights and digital backdrops for getting a proper New Year's Eve photo with your group. It's kind of cool actually because chances are, you're a little dressed up for this event — and you could select one of the in-park digital backdrops that are available — making it appear as though you're standing in front of Epcot's Spaceship Earth — all dressed to the nines! My gut feeling is these photos can't be "connected" to your Photopass photos (if you have that option), because this is a different group of photographers - but they are complimentary digital downloads, and you will receive a small card with instructions on how to get your photos. Because everyone is waiting in this same lobby area for the event to start, lines at these photo stations can get a little long. However, these photographers were set up for at least the first 90 minutes of the event as well… and the lines were much shorter (to almost nonexistent) after the event starts. If you can collect your group together after the first couple of bites and sips — there shouldn't be any waiting at the photo stations. Right at the event start time, three sets of massive doors are opened leading guests into the Fantasia Ballroom! Most convention space can be split into smaller sections but because so many guests attend this event, the space is full open and very large! The first thing that I want to do is have an indoor drone race — but that's probably just me! All the tables are large… like groups of ten or more large. Even though Disney does state that this is a "mix and mingle" event and that multiple parties will be seated together, I still think it catches a few people off guard. Generally, I don't like community seating like this, but at this event… it was totally fine! Why? Because the tables were large enough! I never really felt like I was packed in too close to anyone. Heck, I've had individual tables at several in-park restaurants where I felt like I couldn't swing my arms around without hitting someone. The round convention sized tables at Countdown to Midnight allowed me to do that, so there was enough breathing room for me! When you first check-in for the event, your party will be given a printed card with a table number on it. 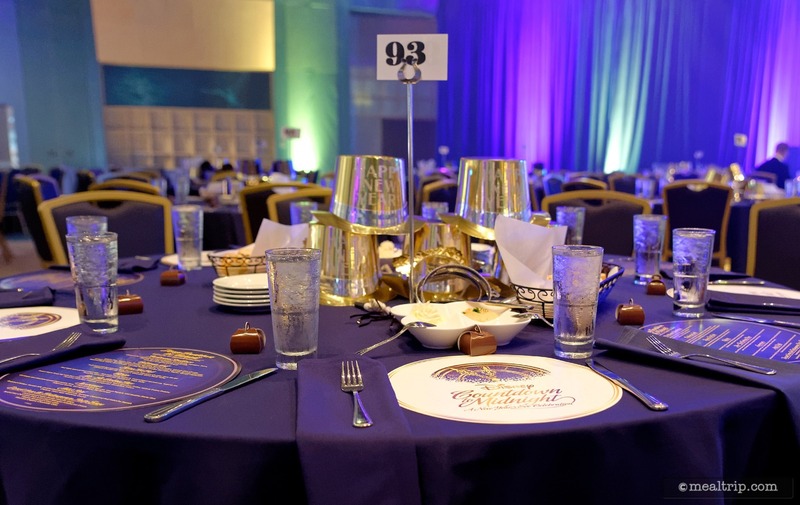 Event staff are on-hand to help guide your party to the correct table. It may not sound that daunting at first, but there are over 100 tables … all marked with a number in each table center piece! It's a lot to take in and process! Each table setting a glass of ice water, some silverware and a napkin, a small box of hand-dipped chocolates, and a circular placemat card that has the event logo on one side, and all the food items that are available on the other, listed with an adult beverage pairing for that food item! A collection of party hats and noise makers are in the center of the table, enough for everyone, along with small plates and several baskets of breads and dips… sort of a "bread service" to start the evening. The various bread and dips that are on the table, are also available at the cheese and charcuterie table, if you would like more! 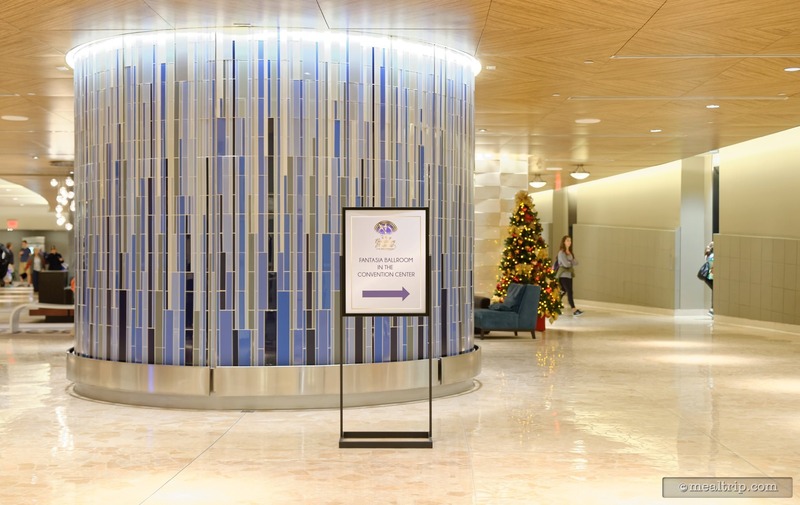 If you go back through the lobby, you'll find the Porte Cochère area. A "Porte Cochère" is basically a "covered porch", and is normally the area where guests would get dropped off if this were a normal convention. For the New Year's Eve event, it has been completely blocked off from traffic — and becomes another mix-and-mingle area, and where you'll watch the fireworks at midnight. All throughout the night, there's either a small band or DJ creating a great musical ambience for the event, leading up to the main "show" element which is a top-notch, "one of the best I've seen", cover bands. This is all guided by two emcee's that keep everyone informed about what's currently going on, and what's next on the agenda. They've done a really great job keeping things low-key and softer in the beginning, and gradually increasing the energy as the night progresses. Starting out with some very soft background music, leading into a couple of sets of solo or duo-based live music (somewhat like coffee shop music) with few DJ spun background tracks in between. There is a main, large, live cover band that performs a long set (for about an hour) before midnight — and they were simply amazing! The 12 member group covered all eras of music from the 50's to modern day, non-stop, with costume changes and dance moves to match the years they were covering! From Elvis to Footloose, Disco, Hard Rock and the electronic sounds of LMFAO — this group filled the room with the kind of energy that you would expect at a great New Year's Eve party!!! There is a large open dance floor in the middle of the room which everyone use at some point throughout the night. No matter if you wanted to get a slow dance in with your sweetheart or join in on a line dance, there was something for everyone — and even a Mirrored Mickey Dance Ball high overhead sending out sparkles of excitement across the entire room! If you've been to an event like the Epcot Food and Wine Festival's Party for the Senses, the format here is very similar. There are tasting stations and beverage stations set around the outskirts of the room. Once your in, everything is all inclusive, so there's no additional purchases to be made. Anything that is being offered at any of the tasting stations is available to you, as many times as you want over the course of the evening. Because the space is so large and there are so many guests, the stations are duplicated right down the middle of the room… so what you'll find on one side — is also available on the other side. While the selections are not as numerous as they are at Party for the Senses, the quality of what's being offered was easily on-par, and they did a nice job of providing a little something for everyone. There were a couple of dedicated wine stations that only had some of the featured wines. I found that these were positioned close to and between the food stations that the wines where to be paired with… so that's nice! Some of the wines featured were a 2014 La Violette Viognier, Cambria Chardonnay from Estate Vineyards, and Chalone Vineyard's Monterey Pinor Noir. There were a few more selections as well, this will just give you an idea of the level. The other beverage stations were a combination of beer and wine, or beer and mixed cocktails. There were around 10 beers, ales, and ciders available (these were poured in a glass, you don't get to keep the bottle). I'm sure there was a card or sign somewhere outlining what the cocktails of the night were (I never found it), but the bartenders seemed to have enough on-hand to make all the usual suspects… from fruit juice and rum style drinks, to a straight up whisky on the rocks and everything in-between. The hardest part was (after a while anyway) figuring out what to ask for. The lines at these bartender stations could get a bit long at times (five or six guests), because they have to mix the drinks to order. The wine station lines never seemed to have more that a few guests lined up, mostly because those are more, "pour and go" type of stations. At a Party for the Senses, you'll occasionally find something new you haven't seen elsewhere, or a master mixologist showing off a new creation — that certainly wasn't the case here. 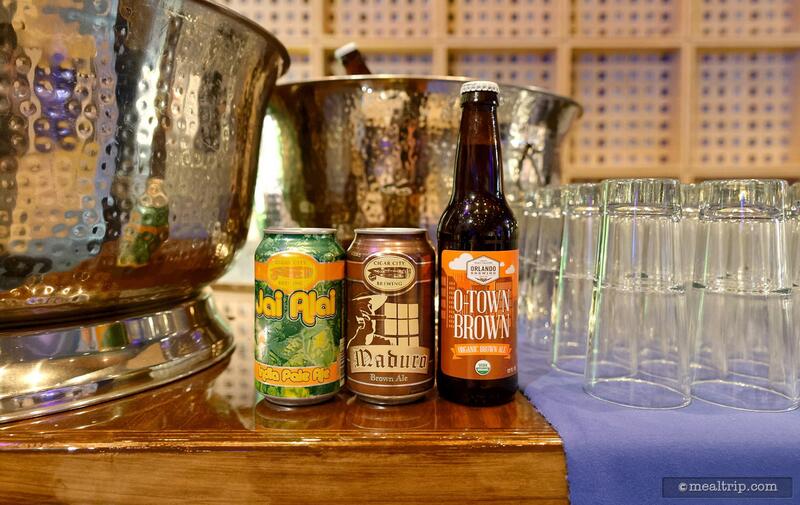 There were all pretty straight forward "good open bar" type of beverage offerings. That's not a complaint — I think it's the right way to go for the 1,000 guests at this event. Anything more complex to create and/or talk about, vintage or tasting profile-wise, and the lines would simply get too long. I do tend to go to these things for the food and beverages — and Disney's Countdown to Midnight New Years Eve event did not disappoint. 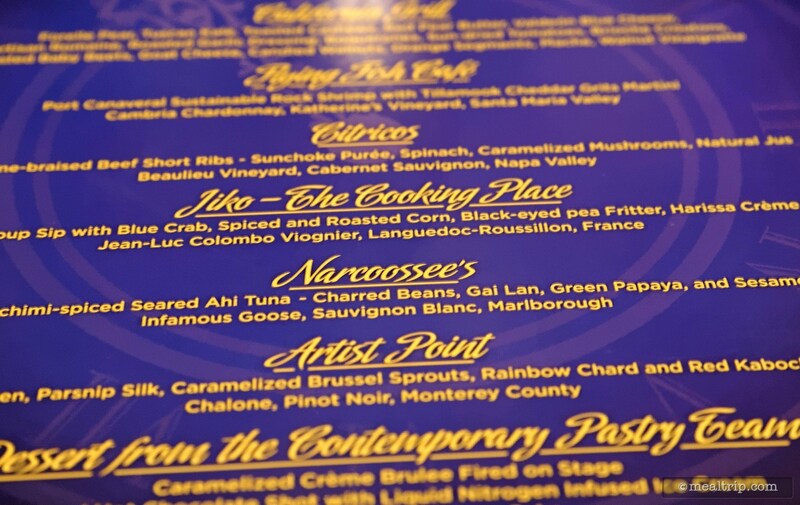 You'll quickly see from the menu/placemat that is at each table setting — each of the food items that are available that night, have been created and are being presented by the culinary teams at some pretty amazing Disney restaurants. The format is basically cooking station / tapas style — so you can walk up to any of the clearly labeled tasting stations and the culinary team will make and plate their item for you. Here again, it's all inclusive, so you can return to any food or beverage station as many times as you would like throughout the night. I am 100% certain the actual food items and restaurants represented will change from year to year. This is just to give some idea of the level of execution and presentation that they're going for. First things first though, there are a few bread baskets and dips on the table when you first sit down. While these are for the table to share, everything is also available at the Charcuterie and Boutique Cheese Station, which was inspired by various selections that are available on the Yachtsman Steakhouse Charcuterie and Boutique Cheese Boards! This was the only "serve yourself" food table, mostly because there were a lot of options spread out over a very large table. 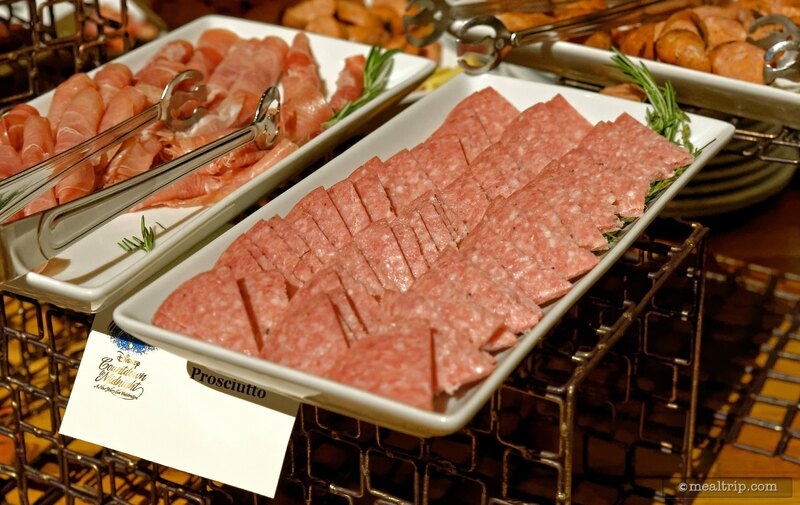 The Charcuterie and Boutique Cheese Station included cured meats, sausages, pates, rillettes, more of the same dips and spreads that have been placed on each table (hummus, balsamic, etc. ), various vegetables and bread. Jiko (the signature dining location at Animal Kingdom) presented a Sweet Corn Soup with blue crab, spiced and roasted corn, black-eyed pea fritter and a harissa creme fraiche — it was as good as it all sounds — and all the parts were assembled only when you walk up to the table! This soup also had a great pairing wine selection — the Jean-Luc Colombo Viognier from Languedoc-Roussillon, France. Over at the Artist Point stations, the chefs were creating a Roasted Chicken and Parsnip Silk dish with caramelized brussel sprouts, rainbow chard and red kabocha squash. While the roasted chicken here was great, I felt like this item might be the "safe choice" for those that aren't very food adventurous. It really was just roasted chicken with vegetables. Citricos was offering a Red-wine Braised Beef Short Ribs (off the bone) small plate that included caramelized mushrooms and natural red wine jus that packed a lot of flavor. The team at Flying Fish had a really tasty dish, that I ended up having two or three of over the course of the night — Port Canaveral (i.e. local and fresh) Sustainable Rock Shrimp with Tillamook Cheddar Grits in a Martini glass! I'm not a fan of grits really, unless they're perfect — and these were! One of the best salad presentations I have seen in a long time came from California Grill's Wall-o-Salad (I made the name up myself). 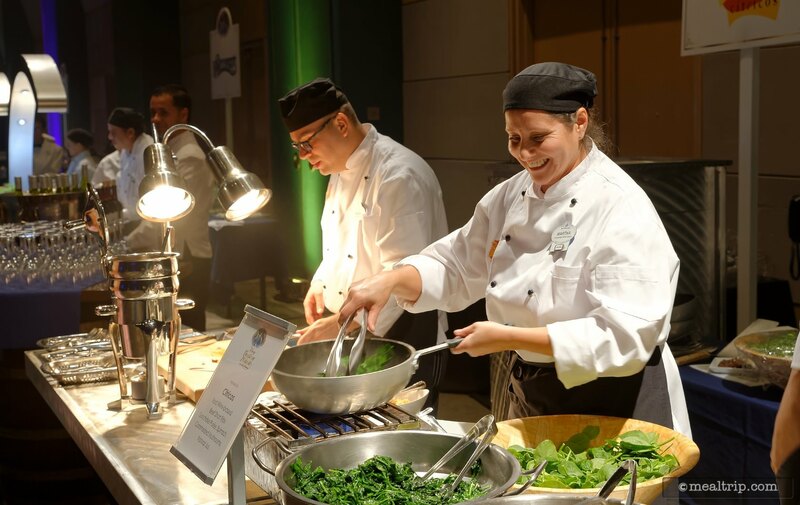 In a partnership with Urian's Urban Farm (local and fresh from Hillsborough County, Florida) — they had a couple of lettuce walls that were filled with the greens that they were using in the three different salads that they were "plating"! I put "plating" in quotes because they were actually building each salad in personal clear plastic spheres, with the dressing, that you could shake to mix table-side! It really was the talk of our table. Being able to see all the individual items that make up the salad in the sphere/bowl, and then shake and mix it yourself (or not if you don't want to), was just so much fun! The salads were pretty amazing too! The three that were being made-to-order were — a Forelle Pear and Kale Salad with toasted cashews, red pear butter and Valdeon blue cheese, a Caesar (of sorts) featuring Artisan Romaine Salad with roasted garlic dressing, boquerones (a variety of fish, similar to an anchovy), sun-dried tomatoes, and brioche croutons, and finally a Roasted Baby Beets Salad with goat cheese, candied walnuts, oranges, and mache (a small edible salad green), with a walnut vinaigrette. 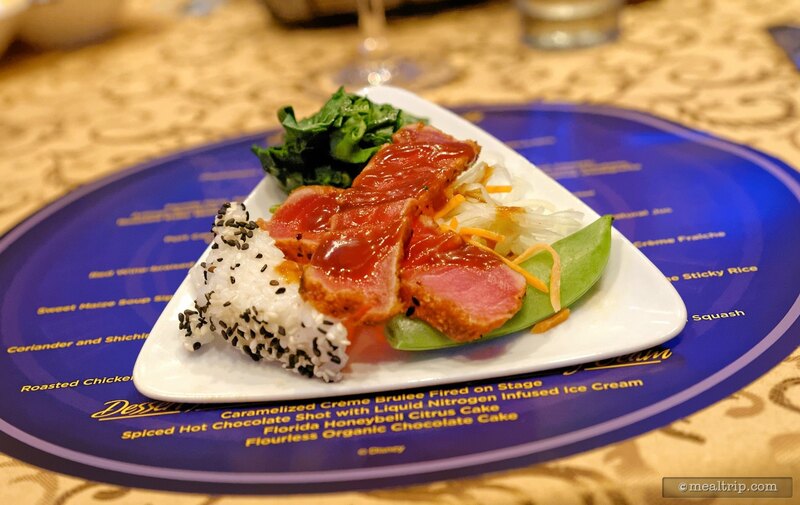 I think my favorite item of the night was Narcoossee's Coriander and Shichimi-spiced Ahi Tuna served with charred beans, green papaya, gai lan (which is sort of like broccoli), and walnut vinaigrette. This dish just had really nice, bright flavors and was not heavy or over spiced at all. It was paired with a Sauvignon Blanc, Marlborough by Infamous Goose. But wait — that's not all! About halfway through the event, dessert stations started showing up! The four desserts were all created by the Contemporary's Pastry Team and included a Caramelized Creme Brûlée which was topped with a few berries and fired fresh on-stage (so while you wait and just for you). There was also a Flour-less Organic Chocolate Cake with a shot of Raspberry Coulis, a Spiced Hot Chocolate Shot with Liquid Nitrogen Infused Ice Cream (which is a spoonable dessert, the nitrogen basically freezes the hot chocolate), and my favorite… a Florida Honeybell Citrus Cake. 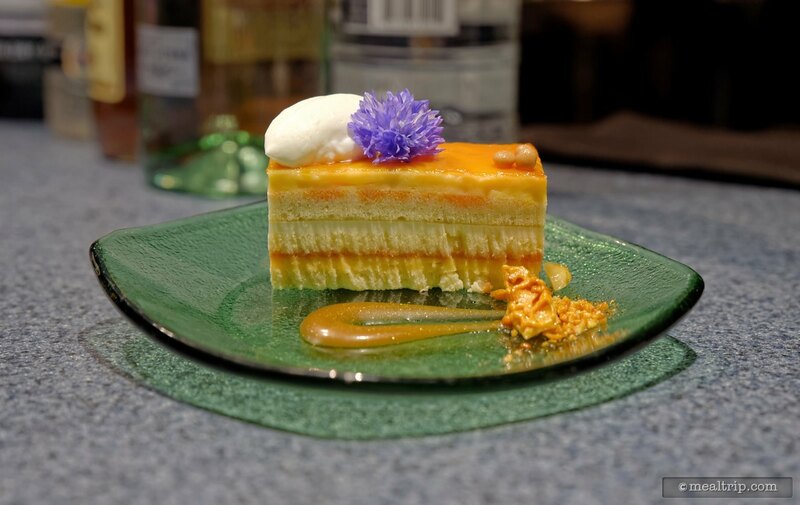 It was the light and bright citrus notes that kept me going back to this dessert. So yummy! About 15 minutes prior to midnight the event emcee's let everyone know it's time to start heading outside if you want to see the Magic Kingdom's New Year's Eve Fireworks. Because I went outside to see those (as most guests did), I'm not sure what all went on inside as the clock struck midnight! It was also around this time that event cast members started handing out flutes of champaign to mark the occasion (and there was plenty of champaign to go around). The Magic Kingdom Fireworks are pretty great from the Porte Cochère location. If you choose, you can stay under cover, but the paved walkway does extend far beyond the overhang. Everyone was very nicely spread out and I never really felt crowded at any time. While (obviously) not offering the same sort of view as you would get right in front of Cinderella Castle, you do get a straight-line view of all the perimeter fireworks going up at the same time, which is really neat — and let's not forget you've got a glass of champaign in your hands, which is really cool too! The piped in music track is the same one that is playing in the park and is timed perfectly to the display. All in all, I felt it was a great mix of not being packed in with 40k other guests and still getting to see the New Year's Eve Fireworks, all while being a little tipsy — isn't that the perfect New Year's Eve trifecta? Once back inside (the event does technically go until 12:15am), I found there were still plenty of refills of champaign available, the food stations were all closed, but the bartenders were all still manning their stations and preparing drinks. I'm not sure if that's what was supposed to happen, or if it will happen again this next year — I would say, just to be safe, think about midnight as being a "last call" and then if you get a little more time after that — it's a bonus! There was another mini Happy New Year celebration about 5 minutes after midnight for those that didn't go outside — a countdown and sparkling confetti cannons and what not — which was a nice touch. I was a little surprised that the dessert station(s) didn't remain open for that last 15 minutes. Sometimes a couple chocolate cakes and some coffee are just enough to get me from tipsy to functioning again. The bartenders did have a great selection of juices left over from the various cocktails (minus the rum for me this time), so I did end up getting several glasses of passion fruit, orange and guava juices (very similar to what's served at Ohana), while I sat and collected my thoughts about the new year ahead! I had a ton of fun, and after a year of (what I thought anyway) were somewhat lackluster events at Food & Wine, I found Countdown to Midnight resorted my enthusiasm for Disney's ability to pull off a large "wow" event. Cost-wise, it is an expensive splurge, but so are most New Year's Eve parties that are similar in scope. The best comparison I have is Party for the Senses during Epcot's Food and Wine Festival. While there are definitely more diverse food and beverage options at a Party for the Senses, I felt the quality of what was being offered at Countdown to Midnight to be on the same level, or slightly better. The entertainment at Countdown to Midnight was way better than anything I've seen at Party for the Senses in the past few years, and the Fantasia Ballroom is definitely a lot easier to get to, when you're all dressed up for a party. The complimentary group photos are a nice touch but it's really the exclusivity of the event (it only happens once a year) the drives the cost over slightly over going to a Party for the Senses event. Countdown to Midnight year ending 2018 is $275 per person (tax and gratuity included) — Party for the Senses for 2018 is $229 per person (plus tax, gratuity included). There is an elite extra add-on to the Countdown to Midnight event itself — a whole new room with even more food, beverage and entertainment options for 2018-2019 called "The Disney Ink & Paint Club". The Disney Ink & Paint Club event is ONLY available as a combination ticket with the Countdown to Midnight event. While the total ticket price is $450 per person (tax and gratuity included) — the highly themed private area promises to be truly spectacular. Set in a "lounge" reminiscent of a bygone era, the décor and classic jazz pianist will pay tribute to the iconic Ink and Paint department of Walt Disney Animation Studios. Mickey and Minnie will be on-hand and dressed to the nines for the event (along with special photographers to capture your group with the duo). In addition to all of the food and beverages that are available at Countdown to Midnight — even more, private, and upscale food and beverage options will be available to Ink & Paint Club attendees such as Whole Alaskan Dutch Harbor king crab, Asparagus, black trumpet mushrooms and sweet garlic parmesan Gnocchi, and Lobster Thermidor macaroni and cheese, served on the half-shell and brûléed-to-order. Both levels of the event — do book solid, months before New Year's Eve! So if you want to go, there's no time to waste. Reservations can be made by calling (407) WDW-DINE or (407) 939-3463. All event tickets are pre-pay. CLICK HERE to view all 112 images in our photo gallery.